Josef Pieper was one of this century's most influential thinkers. A leading Catholic philosopher, he won a wide audience through such books as The Four Cardinal Virtues and About Love. 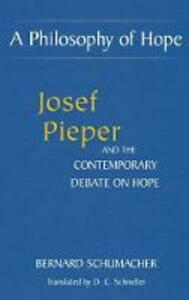 This book is one of few extended studies of Pieper's thought-in particular, of the concept of hope. Pieper was one of the first modern philosophers to explore the idea of hope, and Schumacher discusses his development alongside contributions by Sartre, Jaspers, Marcel, Heidegger, Bloch, and other thinkers. He examines Pieper's treatment of hope as an aspect of individual potential and as an historical force, exploring such themes as dignity, ethics, the good, and the just.